Choose between either the regular or the variant cover of this first exciting issue! The Regular cover is $5 + shipping and the Variant cover is $10 + shipping. Choose the issue and then click the PayPal button to place your order! The second is to head over to Dr. No’s Comics & Games Superstore located in Marietta, Georgia. When you purchase your comic at Dr. No’s, not only are you helping me but all local creators in the Atlanta area. I have autographed each copy currently in stock, but you’d better not wait because I know they’re selling fast! 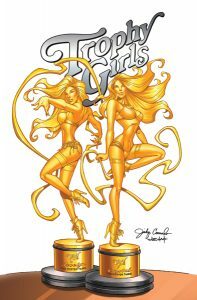 The third option is to purchase Trophy Girls issue 1 at comic-book conventions and local appearances. Right now I am gathering next years schedule of conventions which would benefit Crystal and I appearing at. As of right now, Crystal and I will be doing a signing at Dr. No’s on Free Comic Book Day 2019. I will have more information to provide as we get closer to that day. Meanwhile, the script for issue #2 is finished and now in the hands of an incredible artistic team at Glass House Graphics! I do plan on releasing Trophy Girls issue 1 in digital format but right now, I’m thrilled to have my first printed issue!